What is strange about the award is that Bechtel were the most expensive of the three final Tenderers for the MC3 package, behind consortium's lead by CCC and J&P. Now, I happen to currently be reading a book called "Confessions of an economic hitman" in which Bechtel are specifically being named as being a favoured Contractor with the US AID and similar aid organizations. Well worth a read if you have the time! Funnily enough, click here to see Bechtel's work in Iraq - the Client..... USAID! Timing is a funny thing, sometimes. I wonder why Bechtel were awarded the job, when they were the highest of the three final tenderers? Technical expertise? One sentence book review: Confessions of an economic hitman read like a bad airport lounge pickup line. Great post, thank god they finally got it tendered. Unrelated: Still aware that we owe you money. Will sort that ASAP. Love you guys to death. Miss you. We all know that everything costs double in Oman compare to else where including roads and towns. Example Khuwair 33 cost a much Shatti to build but look at the difference. Even the tender for aircrafts cost more than other countries paid for same. Yeah it makes you wonder. By the way there were more tenders for this airport from different people and different countries - question why always the elite few in Muscat manage to win these tenders. I thought that given all 3 companies vying for the project are very experienced and equally matched, generally speaking, that the project would be awarded based on the only difference that being pricing. Very interesting and surely there is much more to this story. graft on an epic scale in Oman, but such is life..
One of the longest/tiring project i am working with for my entire carrer....Hope the project will go well and hope we will bag the facade works.. Strange that Bechtel's winning tender was not that far from J&P's price for the original design and of course J&P's new price is much lower than Bechtel's. The money saved could be used elsewhere one would have thought. The Bechtel winning tender was considerably more than CCC or J&P. It wasn't even close. Just when the world is tightening budgets and looking to save money a contract of this size is awarded to the highest bidder is a true head scratcher. There must be another story behind the story. And, my guess is we will never know. It seems quite wrong because the reason it went for re-tendering was that the bids they got were too high so why all of a sudden is money no object? It is not about money. It is about politics. 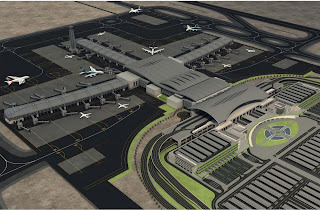 If Oman saw how Bechtel has been failing the new airport in Qatar, they should have not even short-listed them. Also they have been kicked out from Dubai Airport Project after finishing T1. Good Luck to Tender Board Committee and Bechtel..Hope the project will go well..
Maybe part of a deal with the US, we pay & build new miltary airports (Mussanah) you give work to our highly placed companies..? Congrats to your new terminal to be opened in 2020! Lot's of comments here, and lots of theories. To the anonymous poster that said "There must be another story behind the story. And, my guess is we will never know." - I think you are right. It certainly does raise concern when the tender price was so much higher than the other two prices tendered, but I'm sure there must be some valid reasons why they were successful. Thank you all for commenting on this, please carry on if you have something to say! i do agree with few of ur comments on tender being awarded to the highest bidder which ofcourse is not fair. However, in such large scale projects one has to see the reputation of the local consortium partner whcih is very important.their past and recent performance is also taken into consideration. bahwan already working in muscat airport could have given them an extra point. no doubt bechtel has used the Political power. I feel very sorry for the other two bidders J&P and CCC. This saga has gone on for 2 years. Think of all those wasted man hours and resources. I know that the lowest bidder is not guaranteed to get the job, but when the difference in the bids for the terminal building was so huge, one has to wonder. wiki: True that BEC was the highest bidder but what was considered more then price was the specification about the work. So they choosed the highest quality and also the highest price. So much jealousy! BEC are the best suited for this project so get over it and find another project to tender on. BEC comprise the most experienced design team for this type of work compared to the other bidders. BEC now screwing up vendors to meet their budgets ,,,also considering bringing dubai based vendors .... how Omani companies will sustain and how companies will create jobs if they dont get to work with such large scale projects .... and strangely consultants also say NO to oman products . no one is taking action against such unprofessional . Its strange .... why MOTC is keeping quiet ...if such things are happening ! We shall install approximately 140.000 m2 of Omani Desert Rose Stone cladding in this project which makes about %37 of total Stone work. The rest is mostly granite for which an alternate from Oman is not available. So producers of Desert Rose are gonna be quite busy next year.